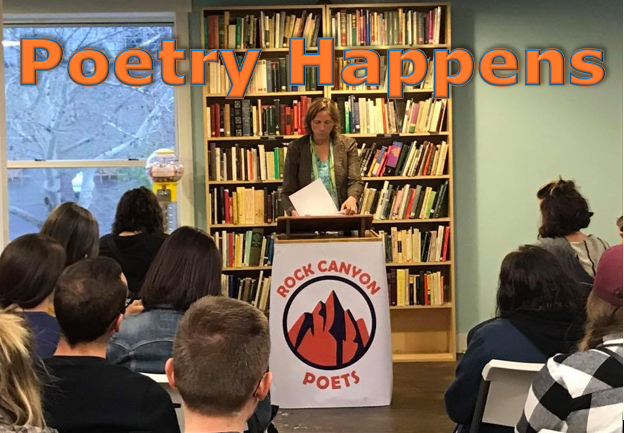 Rock Canyon Poets poetry reading & open mic every 2nd Tuesday at Pioneer Book in Provo, this month on March 12, 2019 from 6:30 – 8:00 pm featuring Nancy Takacs and Jan Minich! City Art Reading Series, typically first three Wednesdays of every month during the school year at 7 PM at the Salt Lake City Downtown Library. Check their Facebook page for event announcements. This month on 3/13 Rock Canyon Poets members Trish Hopkinson and Tacey Atsitty! LEAP into Science and Poetry – Parents and children ages 5-12, to help kids understand how to think like poets and scientists. Wednesday, March 20, 2019 – 4:00pm to 5:00pm at the Chapman Library Branch, 577 S 900 W, Salt Lake City. Jacqueline Osherow | My Lookalike at the Krishna Temple – poetry reading and book signing. Thursday, March 21, 2019 – 7:00pm to 9:00pm at The King’s English Bookshop in Salt Lake City. Visual Poetry Series workshop – A series of three standalone workshops to take poetry into the visual medium. Saturdays, March 9, 16 & 23 from 11am – 1pm at Utah Museum of Contemporary Art in Salt Lake City. Slam Poetry workshop – local poet RJ Walker leads a workshop on slam poetry. Learn how to compose poetry with its spoken performance in mind as well get tips on performing in public. Cost: $20. Wednesdays, March 20 & 27 from 6 – 8pm at SLCC Community Writing Center in Salt Lake City. Rock Canyon Poets poetry reading & open mic every 2nd Tuesday at Pioneer Book in Provo, this month on February 12, 2019 from 6:30 – 8:00 pm featuring City Art’s very own Joel Long! City Art Reading Series, typically first three Wednesdays of every month during the school year at 7 PM at the Salt Lake City Downtown Library. Check their Facebook page for event announcements. This month on 2/6 Trish Hopkinson and Tacey Atsitty; and on 2/13 Katharine Coles and Lance Olsen. Helicon West open mic for poets and writers, Thursday, February 14 from 7 – 9 PM at Logan Library. An Evening of Rumi with Renowned Translator Coleman Barks and cellist Eugene Friesen – Presented by Jung Society of Utah at Libby Gardner Hall – University of Utah, Salt Lake City UT, Feb 17, 2019 at 07:30 pm – 09:15 pm (Sun). Poetry and a Beverage – Come perform, watch, or socialize at PoBev! Saturday, February 16, 2019 from 9:00 pm – 11:00 pm. Utah State University, Taggart Student Center, Evan N. Stevenson Ballroom. Poetry in the Park – Presented by Utah State Poetry Society at Zion Park Lodge, Springdale UT. A two-day event will occur featuring visiting poet Kimberly Johnson from BYU, presenting a free poetry reading on Thurs, Feb 28 in Springdale sponsored by Z Arts at the Canyon Community Center at 7pm. Overnight lodging available at winter rates in Springdale for those wishing to stay for Poetry in the Park the next day at the Zion Park Lodge from 9am to 3pm. More information at http://www.utahpoets.com/. Tickets at https://zionpark.org/events/. Utah Life Magazine – The theme for the May/June 2019 issue is “Railroad,” and the deadline is March 1, 2019. Rock Canyon Poets poetry reading & open mic every 2nd Tuesday at Pioneer Book in Provo, this month on January 8, 2019 from 6:30 – 8:00 pm is the release party for our fourth annual anthology of poems entitled Orogeny. Contributors will read their work and audience members are welcome to read poems during the open mic. Copies of Orogeny will be available for purchase and light refreshments will be served. City Art Reading Series, typically first three Wednesdays of every month during the school year at 7 PM at the Salt Lake City Downtown Library. Check their Facebook page for event announcements. This month on 1/9 Kirstin Scott and Lynn Kilpatrick; and on 1/16 Ashley Farmer and Karin Anderson. Helicon West open mic for poets and writers, Thursday, January 10 from 7 – 9 PM at Logan Library. Carol Moldaw, Cori Winrock, and Noam Dorr Reading – The University of Utah Guest Writers Series presents an evening of poetry and nonfiction with authors, Thursday, Jan 17, 2019 at 7:00 pm – 8:00 pm at Finch Lane Gallery at the Art Barn, 54 Finch Lane (1320 East 100 South), Salt Lake City. Poetry and a Beverage – Come perform, watch, or socialize at PoBev! Saturday, January 26, 2019 from 9:00 pm – 11:00 pm. Utah State University, Taggart Student Center, Evan N. Stevenson Ballroom. Poetry Reading by Robin Becker and Jennifer Elise Foerster – Anne Newman Sutton Weeks Poetry Series – Free readings begin at 7:00 pm in the Kim Adamson Alumni House at Westminster College and are followed by book signings and receptions, Monday, Feb 4, 2019 at 7:00 pm at 1840 S 1300 E, Salt Lake City. Provo Poetry POEMBALL Machine – Second annual cash prize contest! Judged by Utah Poet Laureate Paisley Rekdal. Send in up to 10 short poems to be included in the POEMBALL Machines in Provo and SLC with a chance to win $50 – $100. Welcome to the new Utah monthly edition of Poetry Happens, brought to you by Rock Canyon Poets. Each edition will include poetry happenings and other announcements coming up in Utah, with highlights specifically for Utah county. And tune in on KRCL Radioactive the first Wednesday of every month for announcements and feature poet reading! Rock Canyon Poets poetry reading & open mic every 2nd Tuesday at Pioneer Book in Provo, this month on December 11, 2018 from 6:30 – 8:00 pm, featuring Utah poet and professor Lisa Bickmore. Kristen Tracy reading and signing of her new poetry collection, Half-Hazard. Tracy will be joined in conversation by Brian Evenson at The King’s English Bookshop on Tuesday, December 4, 2018 at 07:00 pm. City Art Reading Series, first three Wednesdays of every month at 7 PM at the Salt Lake City Downtown Library. Nature Poetry Reading on Wednesday, December 5, 2018 – 7:00pm to 8:00pm at the Salt Lake City Library. The reading will feature poets Alison Deming, Kate Coles, and Paisley Rekdal. Helicon West open mic for poets and writers, Thursday, December 6 from 7 – 9 PM at Logan Library. Poetry Open Mic every 2nd Thursday at the Glendale Branch Library in SLC at 7 PM. LEAP into Science and Poetry at Glendale on Wednesday, December 19, 2018 – 4:00pm to 5:00pm at the Glendale LIbrary, 1375 Concord St, Salt Lake City. Utah Life Magazine – The theme for the March/April 2019 issue is “Creeks and Rivers,” and the deadline is Jan. 1, 2018. Rock Canyon Poets poetry reading & open mic every 2nd Tuesday at Pioneer Book in Provo, this month on Nov. 13, 2018 from 6:30 – 8:00 pm is our Inspired anthology release party featuring community poets! Refreshments will be served. Come listen to living Utah poets and share your own favorite poem. City Art Reading Series, first three Wednesdays of every month, Nov. 7, 14, and 21 at 7 PM at the Salt Lake City Downtown Library. Sugar Slam, every 2nd Thursday at Watchtower Cafe in SLC, Thursday, Nov. 14 at 8 PM. Poetry Open Mic every 2nd Thursday at the Glendale Branch Library in SLC, Oct. 11 at 7 PM. Helicon West open mic for poets and writers, Thursday, Nov. 14 from 7 – 9 PM at Logan Library. Poems from the Front Nov 15, 2018 at 07:30 pm – 09:00 pm in Salt Lake City, Babcock Performing Readers present a program of poetry from the Great War. Presented by Babcock Performing Readers at University of Utah – A. Ray Olpin Union Little Theatre. Utah Life Magazine – The theme for the March/April 2019 issue is “Creeks and Rivers,” and the deadline is Jan. 1, 2019. Rock Canyon Poets poetry reading & open mic every 2nd Tuesday at Pioneer Book in Provo, this month on October 9, 2018 from 6:30 – 8:00 pm, featuring Utah poet Lance Larsen. Utah Humanities Book Festival runs through October including several poetry readings and other literary events. Click here for the complete calendar. City Art Reading Series, first three Wednesdays of every month, Oct. 3, 10, and 17 at 7 PM at the Salt Lake City Downtown Library. Oct. 10 – City Art and Utah Humanities Book Festival are pleased to host members of the Rock Canyon Poets on Wednesday, October 10 at 7:00 PM in the 4th Floor Conference Room of The City Library. Feature poets include Rock Canyon Poets co-founder Bonnie Shiffler-Olsen, Dennis Marden Clark, Lisa Connors, Michaelle Martial, and Jack Garcia. Jimmy Santiago Baca poetry reading – On Thursday, October 4th, poet Jimmy Santiago Baca shares and discusses his work at Weber State University (Dumke Hall, Hurst Building). This event starts at 7:00 PM in conjunction with the Utah Humanities Book Festival, click here for a full schedule of events through Oct.
Alex Caldiero poetry reading – On Tuesday, October 9th, poet Alex Caldiero presents “Close Encounters of the Literary Kind: A Performative Memoire of the Uncanny Nature of Books” at Ken Sanders Rare Books in conjunction with the Utah Humanities Book Festival, click here for a full schedule of events through Oct.
Sugar Slam, every 2nd Thursday at Watchtower Cafe in SLC, Thursday, Oct. 11 at 8 PM. Helicon West open mic for poets and writers, Thursday, Oct. 11 from 7 – 9 PM at Logan Library. UTSPS 2018 Book of the Year Reading by Geraldine Felt (Dancing with Monarchs) on Saturday Oct. 13 at 2:30 p.m. at the Fairfield Village Of Layton: 1205 N. Fairfield Rd., Layton, UT 84041. Poetry-Science Cafe, Wednesday, Oct. 24, 2018 from 7 – 8 PM. Natural History Museum of Utah in SLC, featuring poets Lance Larsen and Kimberly Johnson. Paisley Rekdal – Public Lecture – Weber State University Department of English Presents: Paisley Rekdal, Utah Poet Laureate – Reading of Rekdal’s work. Wednesday, October 24 at 6 p.m. Weber State University, Stewart Library, Hetzel-Hoellein Meeting room, 321. Heber Valley Western & Cowboy Poetry Gathering – 7:00 PM on Oct 24 through 4:00 PM on Oct, 28, 2018. Featuring cowboy poet Waddie Mitchell. Poetry Reading by David Gewanter and Christian Felt – The Anne Newman Sutton Weeks Poetry Series, Oct 29, 2018 at 07:00 pm (Monday) at Westminster College. Peculiar Journal – Utah-based literary journal for LGBTQ+ writers and artists. Deadline: Oct. 28, 2018. Utah Life Magazine – The theme for the Jan/Feb 2019 issue is “Inversion,” and the deadline is Nov. 1, 2018. Free Poetry Class – Open to the community and students at Westminster, click here to apply for a free semester poetry class beginning in January 2019 with visiting poet Robin Becker. Deadline to apply is Oct. 15, 2018. 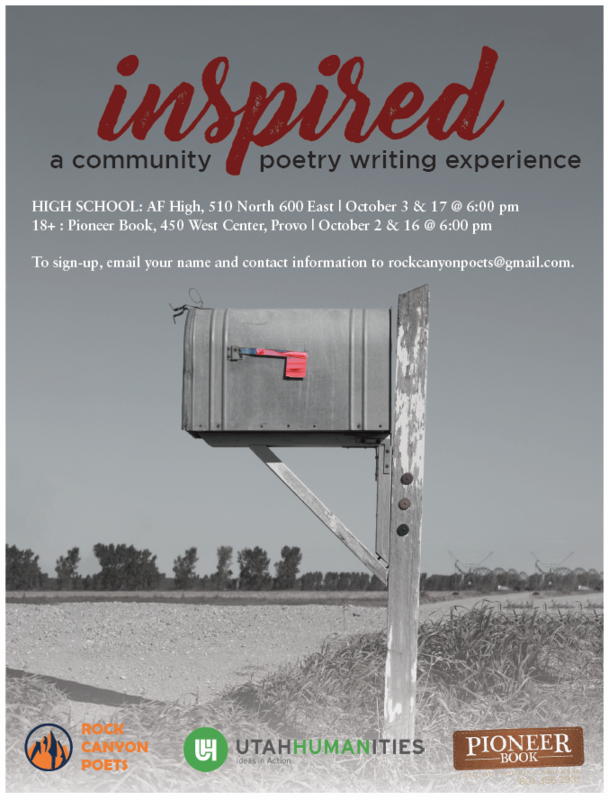 The Rock Canyon Poets and Pioneer Book, in participation with the Utah Humanities Book Festival, presents “Inspired,” a free community poetry writing workshop in October. This year the workshop is being expanded into to tracts, a workshop for adults ages 18+ and new this year, a second workshop for high school ages. Poems as letters, or “epistolary” poems refers to the tradition of poets writing to people (or other things) in poetic form. In this workshop, participants learn how to write new poems inspired by prompts based on letter writing. Offered annually in participation with the Utah Humanities Book Festival by Rock Canyon Poets & Pioneer Book, this workshop is presented in two sessions, followed by a reception & poetry reading. Participants are encouraged to submit their poem to be included in a printed anthology and contributors will receive a free copy. To sign-up, email your name and contact information to rockcanyonpoets@gmail.com. Seating is limited. Come ready to write! The Utah Humanities Book Festival runs from September 7 – October 31 with events in several cities throughout Utah. For more information, visit their web site utahhumanities.org. Co-founded by Bonnie Shiffler-Olsen and Trish Hopkinson in January, 2015, Rock Canyon Poets was established to develop camaraderie among Utah Valley poets, provide consistent workshopping and reading opportunities, and promote the disciplined study of writing poetry as a serious art form. Members meet twice a month at Pioneer Book in historic downtown Provo. The group sponsors poetry readings and an open mic on the 2nd Tuesday of every month. Membership is by invitation or portfolio submission only. Rock Canyon Poets poetry reading & open mic every 2nd Tuesday at Pioneer Book in Provo, this month on September 11, 2018 from 6:30 – 8:00 pm, featuring Alex Caldiero for a special 9/11 tribute reading. Inspired: A FREE Community Poetry Writing Workshop registration is open! Workshops are on Tuesday nights on Oct. 2 and 16. This year the workshop is being expanded into to tracts, a workshop for adults ages 18+ and new this year, a second workshop for high school ages. To sign-up, email your name and contact information to rockcanyonpoets@gmail.com. Seating is limited. City Art Reading Series, first three Wednesdays of every month, Sept. 5, 12, and 19 at 7 PM at the Salt Lake City Downtown Library. Sugar Slam, every 2nd Thursday at Watchtower Cafe in SLC, Thursday, Sept. 13 at 8 PM. Poetry Open Mic every 2nd Thursday at the Glendale Branch Library in SLC, Sept. 13 at 7 PM. Helicon West open mic for poets and writers, Thursday, Sept. 13 from 7 – 9 PM at Logan Library. Tyehimba Jess poetry reading – Weber State University presents Pulitzer-Prize winning poet Tyehimba Jess at St. Joseph Catholic High School on Tuesday, September 18th (Reception at 6:00 PM and reading at 7:00 PM) in conjunction with the Utah Humanities Book Festival, click here for a full schedule of events through Oct.
Poetry Reading by Camille T. Dungy and Jason Olsen – The Anne Newman Sutton Weeks Poetry Series, Sept. 24 at 7 PM at Westminster College. Ken Waldman Fiddling Poet, Sept. 24, 2018 at 7 PM, Kigalia Fine Arts in Blanding in conjunction with the Utah Humanities Book Festival, click here for a full schedule of events through Oct.
Andrea Hollander, Sept. 27, 2018 at 7 PM, King’s English Bookshop in Salt Lake City in conjunction with the Utah Humanities Book Festival, click here for a full schedule of events through Oct.
Ars Moriendi Opening: Featuring Lance Olsen, Kristin Scott, Shanan Ballam, and Michael McLane, Sept. 28, 2018 at 6 PM, Bountiful Davis Art Center in conjunction with the Utah Humanities Book Festival, click here for a full schedule of events through Oct.
Provo Poetry POEMBALL Machine – Send in up to 10 short poems to be included in the POEMBALL Machines in Provo and SLC. Deadline: Sept. 30, 2018. Rock Canyon Poets poetry reading & open mic every 2nd Tuesday at Pioneer Book in Provo, this month on August 14, 2018 from 6:30 – 8:00 pm, featuring Rob Carney and the release of his new book The Book of Sharks! Sugar Slam, every 2nd Thursday at Watchtower Cafe in SLC, Thursday, August 16 at 8 PM. Salt City Slam, every last Monday of the month at Even Stevens in Downtown SLC, August 27, Open mic at 7:00. Feature at 7:30. Slam at 8:00. Poetry Open Mic every 2nd Thursday at the Glendale Branch Library in SLC, July 12 at 7 PM. Helicon West Summer open mic for poets and writers, Thursday, August 23 from 7 – 9 PM at Logan Library. Provo Poetry POEMBALL Machine – Send in up to 10 short poems to be included in the POEMBALL Machines in Provo and SLC. Open so submissions year-round. Utah Life Magazine – The theme for the September/October 2018 issue is “Fall,” and the deadline is August 6, 2018. The theme for the November/December 2018 issue is “First Snow,”and the deadline is September 1, 2018. Free Poetry Class – Open to the community and students at Westminster, click here to apply for a free semester poetry class beginning in January 2019 with visiting poet Robin Becker.